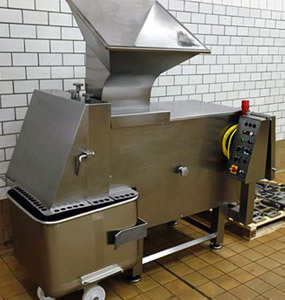 Equipment for processing meat, cheese, poultry, vegetable, and other specialty foods. 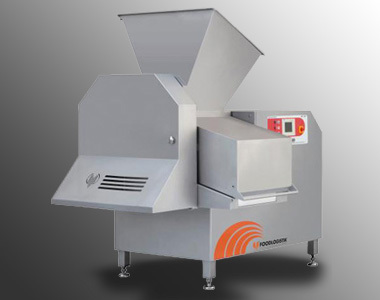 We sell new Foodlogistik Food Dicers, Xtravac Vacuum Packagers, Weber Derinders and Lance Vacuum Tumblers. We sell many varieties of used meat and food processing equipment. Description: Holac automatic dicer with large hopper. Grid size 90x90 mm with 4 grid sets. Capable of producing 2500 lbs of one inch cubes per hour. 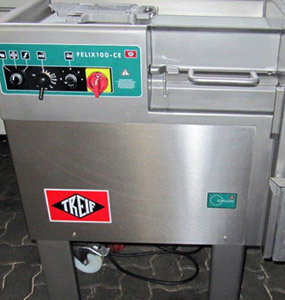 Description: Treif Semi-automatic dicer, with frequency drive feed system. Grid size 96x96 mm with 1 grid set. Capable of producing 1100 lbs of one inch cubes per hour. 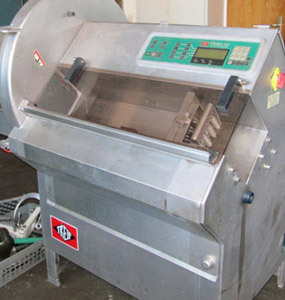 Description: Treif portion cutter slicer with CPU Controller for slice counting, grouping and bulk slicing. Variable speed exit conveyor. 220 V 3Phase.